Squeezing cooking into a busy schedule is hard, especially if you’re trying to whip up a quick and healthy meal. 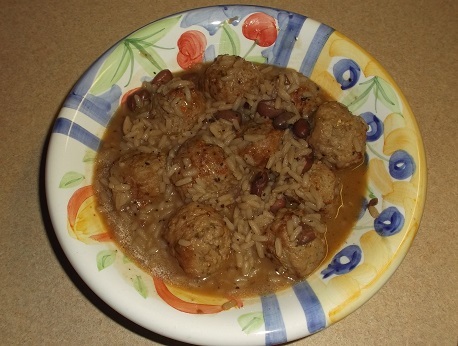 In an attempt to save my bank account and growing waistline from eating out too much, I’ve been lately experimenting with different recipes and came up with this super easy combination of meatballs with red rice and beans. It’s such a quick meal and I love how it packs so much flavor where you can eat it by itself or with some side dishes. The great thing about this recipe is that you can customize the portions so you can have a single serving or enough to feed a small army. Partially drain the can of red rice & beans. Don’t empty all of the liquid because the juice will help cook the meatballs. Empty the can of red rice & beans into a medium saucepan on medium-high heat. Add a quarter of the frozen pre-cooked meatballs (or however much you want, I usually eat 6-9 meatballs) into the saucepan and cover. Stir occasionally so the rice doesn’t burn to the bottom of the saucepan. Turn down the heat to a simmer when it starts to boil. 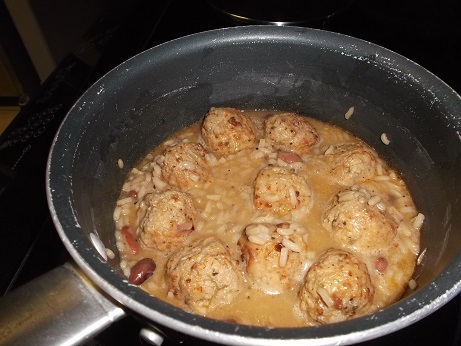 Let simmer for 5 – 10 minutes, or until the meatballs are soft to the touch and browned. Take the saucepan off the heat once meatballs are cooked through and let rest for several minutes.